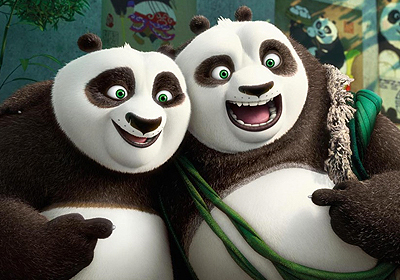 "packed full of slapstick comedy and superb fight scenes, it has the same flaws as the previous entry"
Following the success of Home, DreamWorks Animation returns with the third instalment of the Kung Fu Panda series and it is nothing short of awesome! Picking up in the spirit realm, we are greeted by Master Oogway (Randall Duk Kim) who is fending off an attack from Kai (J.K. Simmons) who wants Chi to return to the mortal realm, forcing a spectacular confrontation with Oogway. When he does return to the mortal realm, he begins to lay waste to China and the Kung Fu Masters in his pursuit of Chi and to do battle with Po the Dragon Warrior (Jack Black) and the Furious Five. Po is reunited with his long lost father; Li (Bryan Cranston) and together with Po’s adoptive father - Mr. Ping (James Hong) travel to the hidden Panda village to learn about his true heritage and how to harness Chi. Kung Fu Panda 3 wastes no time in getting into the plot. It moves quickly and is stunningly animated: the characterisations and setting are beautiful and colourful, an aspect that we have grown to admire from DreamWorks. At the heart of the story is the theme of family, something that is ever present and represented extremely well by Black and Cranston, as Po rediscovers his long lost heritage. As well as Black’s Po, the voice cast is brilliant. The addition of Cranston adds some welcomed gravitas to proceedings and Kate Hudson as Mei Mei is genius; Mei Mei is funny and positioned as a somewhat love interest for Po. Whilst I wholeheartedly enjoyed Kung Fu Panda 3, which is packed full of slapstick comedy and superb fight scenes, it has the same flaws as the previous entry, being that it under utilises both Jackie Chan and Angelina Jolie. Their characters, Monkey and Tigress, respectfully, utter very few words, so it seems a waste of their talents; however the characters themselves are wonderful and are key to the story. Kung Fu Panda 3 is a fitting entry to the franchise, and if this is the last, then it wraps up nicely whilst leaving it wide open for more stories to tell.